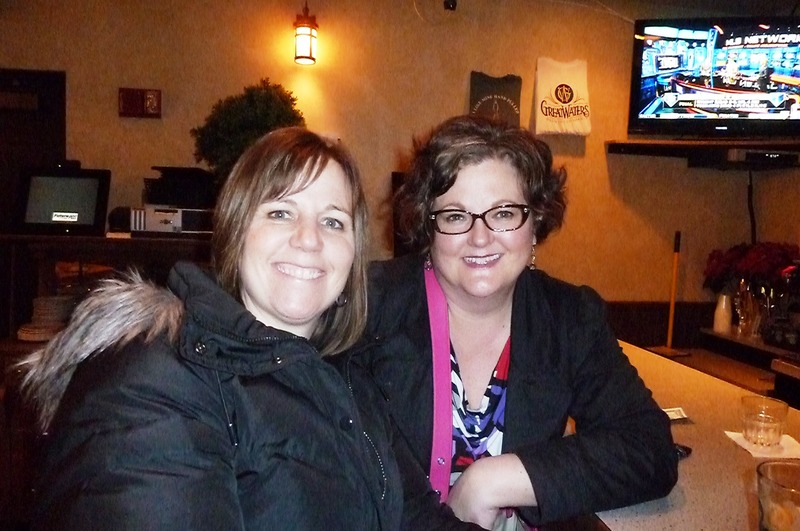 A January mini-vacation at Deadra’s, including many movies and much wine! It was a great mini-vacation at Deadra’s! Good conversations, good wine, good food, and a good (great!) movie! As well as some great dance parties! Read “Persuasion” by Jane Austen with Wallace’s readalong in January – I fully participated in the “Persuasion” readalong! Woot! Readalongs are so good… inspires you to have a deadline, critically think about what you’re reading, attempt coherent communication about those thoughts. Good stuff. 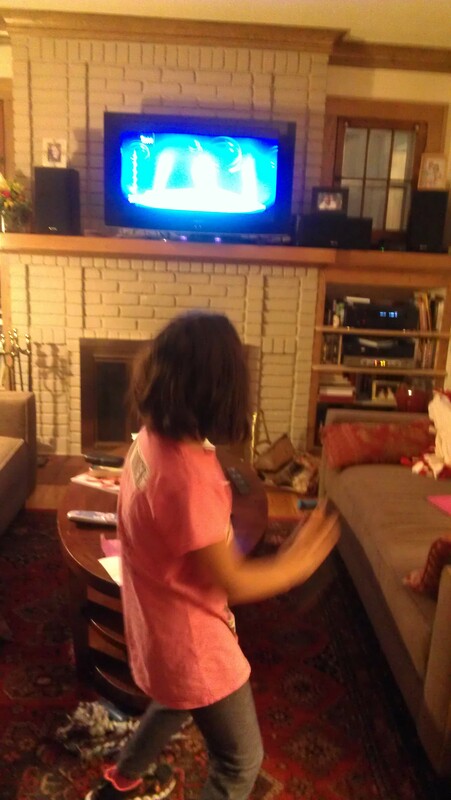 I didn’t participate in her next one, “Crime & Punishment,” but a friend is and is loving the book! Guess I’ll have to add that to my TBR list! START reading “Gone With the Wind” in February – it’s so large I’m not sure I can finish it in two months! But it’s after “Persuasion”! I started it! Had a few great days of reading and then kind of fell off that wagon… I’m on pg 200 (of 900) so quite a ways to go. It is a great book and amazing how much of it is already in my head through the movie and knowledge of the movie. Hopefully I will have quality reading time throughout the month so that I can finish sooner than later! So many books to read! “The Book of Mormon” with Deadra and John in February! This was such a fun event! 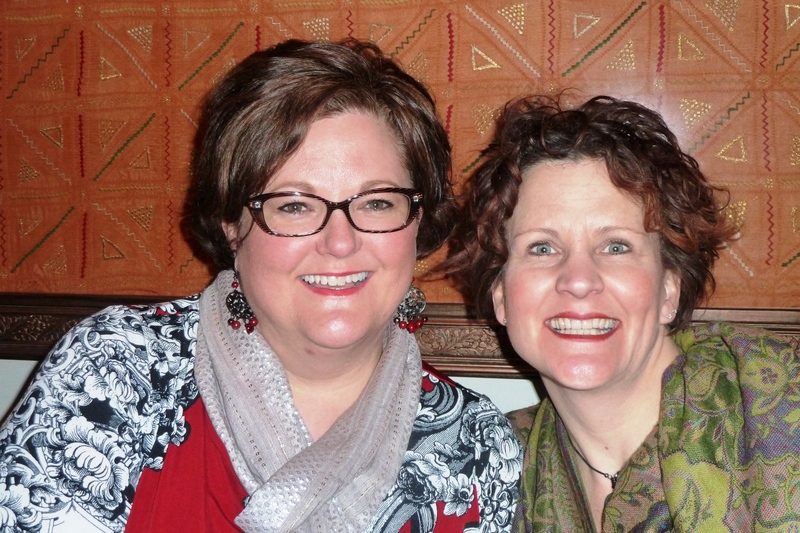 We had dinner at a great Indian restaurant (Bombay Bistro), a brisk walk to the show, and belly laughs throughout! I already posted about turning my pins into magnets (making me happy! ), and when I hear someone shout, “Hello!” I usually sing the next line in my head! Good stuff! Pre-show dinner @ Bombay Bistro! 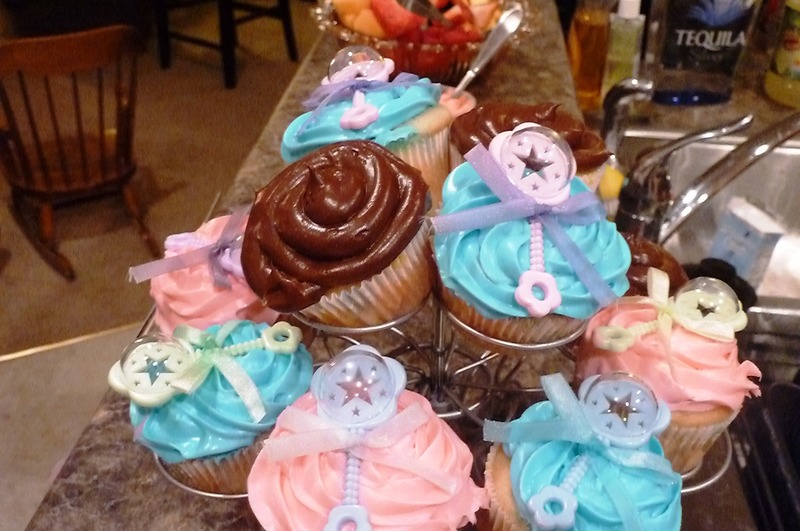 Host a baby shower for a work colleague at my house on February 13! This was a lot of fun, too! It was fun to share my home with my new co-workers, meet family of the guest of honor, have delicious and fun food and drink, and simply socialize with the great people I work with! Shower Sweets – what will it be? A boy or a girl? Can’t wait to see! Gaelic Storm in March with Kristine! Last weekend we finally saw them in concert! We have been talking about going to see them for more than a year and it finally happened. It was so fun! 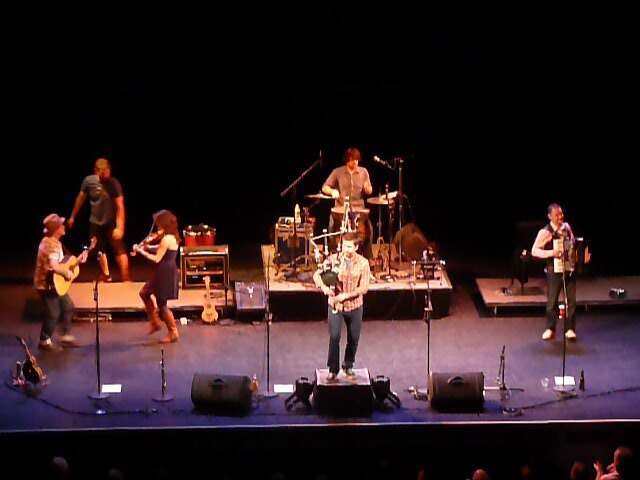 It was at the Fitzgerald Theatre, which was fun to see on its own, and they are so fun to listen to! Clever, quirky, energetic, and fun! A great concert with great friends! Post-concert – not going strong, but still looking good! 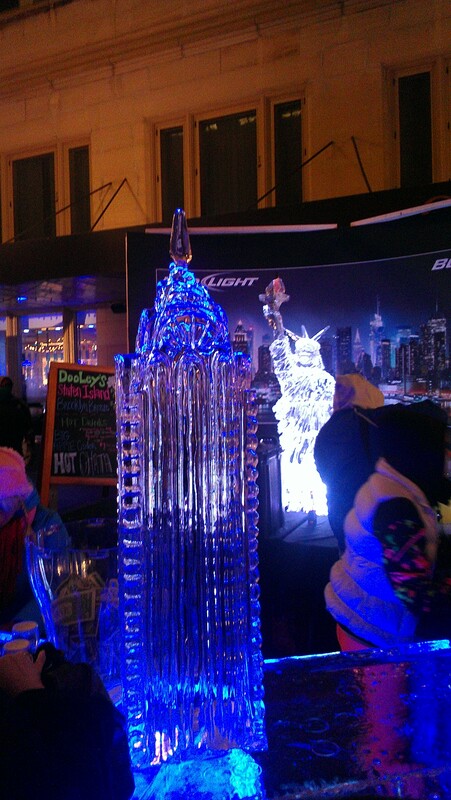 Social-ICE in February! Already blogged a bit about this, but worth mentioning that it was a great time once again! 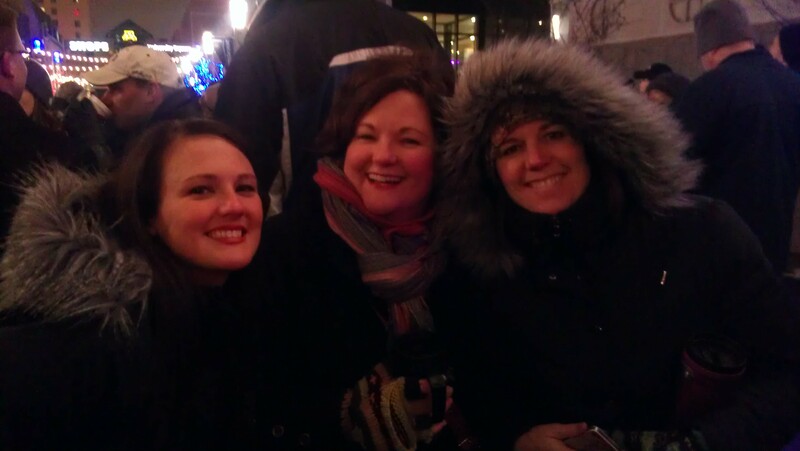 Keeping warm at SocialICE 2013! Walk at least twice weekly and do yoga once weekly. I was doing pretty good at this – in fact it was happening for all of January and into February. But horrible knee pain has derailed that and I think it’s been a month since I walked for exercise, as I can barely walk to “get where I’m going” without terrible pain. There’s been a doctor’s visit, a steroid shot, and now I don’t know what the plan is. Bummer, eh? So I’ve been focusing on healthy food choices (and easy quick cooking meals, since it hurts to stand in the kitchen and cook!) instead of getting my heart rate up. Boo. Spray Tan! Get the look of a summer glow! Have not done this yet but will have to make a plan for that soon! Maybe next week during my days off… or maybe before Easter… or maybe on April 1 so the glow moves in to Q3! Pick a closet and clean it out OR watch all of the Oscar nominated movies (which would you rather do??) Well, I didn’t get either one fully done – yet! I still haven’t seen Amour, Django Unchained, or Zero Dark Thirty. I’m ok with that to this point, but I will look for them on DVD when they’re available. Still can’t wait to purchase Silver Linings Playbook, as it was my favorite of all. And cleaning? Hmmm.. maybe I’ll get to a closet. We’ll see! Invigorate book club and plan ahead for the year. Well, we met in February to discuss The Great Gatsby and ate and talked for 4 hours! We did discuss the book and are now reading another book from the Book Club in a Bag program – We Are All Welcome Here! And we have a date picked for our next meeting – April 2. No plan for the year, but a little more planful to get together! Well, there’s my list – as I said, I haven’t done as badly as I thought I had! I will have to start making my list of 44 Things: Q3 very soon, as April will no doubt be here before I blink again! This entry was posted in Stuff About Me and tagged 44 things, Academy Award, book club, Book of Mormon, February, Gaelic Storm, Great Gatsby, ice bar, knee pain, lists, readalongs, Silver Linings Playbook, Spring, walking, Zero Dark Thirty. Bookmark the permalink.